I, like a lot of other people, got a new laptop this holiday season. I upgraded my work laptop from a Dell model to the Lenovo U410, and in doing so I made a couple mistakes and learned a few tricks that I'd like to share. My experience was far less painful than I expected, but it could still have worked out better. For example, i didn't do the right kind of research before buying this laptop. There are reviews that tell you how good a device is, and then there are reviews that tell you the problems with it. The former usually come from bloggers, while the latter often come from users. My one biggest mistake was that I didn't go looking for user reviews. The U410 was universally loved by bloggers, and they reported much the same good news about the tablet. This wasn't a wunder-laptop but it sounded like it was a safe purchase (even after I filtered out the hype). But this laptop was not spoken well of by at least some owners. There is a mess of posts on the Lenovo support forums complaining about the battery life. Many of the owners had not even hit 3 hours of battery life, much less the 5 or 6 hours which reviewers reported or the 8 hours of runtime which Lenovo lied about in the published specs. The way to find user reviews, in particular the complaints about a device, is to google for the specific component. For example, if I had thought to search for "Lenovo U410 battery" I would have found the complaints. This trick should help you find the known issues for pretty much any device, no matter the component. It turns out that I should have looked for info on how to transfer the content; Microsoft now has an app which will transfer almost all of the content automatically. What's more, this app ships with all copies of Windows 7, so I already had it on my old and new computers. It's called Windows Easy Transfer, and I had to leave it running in the background for a day and a half in order to let it work. It even caught the extra ebooks which I added to calibre while I was still using the older computer. Unfortunately, it didn't transfer everything. I didn't find this out until after I went to run my reading apps and they weren't there. I had to reinstall everything. That's not a serious issue but it does take time and needs to be planned for. And even though I had to install the apps, most were able to find the content which had been transferred. Calibre found my ebook library, plugins, and everything but a couple settings which I had to change to match my preferences. This probably comes as no surprise, but my ebook library of Nook, Kindle, and other DRMed ebooks were not copied to the new computer. If you have a collection Ultraviolet movies then you'll likely spend some time downloading them again. My Firefox configurations did not transfer, so I ended up having to copy them from the old computer to a thumb drive and then copy them to the Profiles folder on the new computer. It didn't take much work, and on the upside this one step also copied all the plugins I was using (Grease Monkey, Adblock Plus, etc). Speaking of plugins, I was surprised to learn that adobe Flash plugin was not included when i installed Firefox. That plugin, along with the PDF plugin, had to be installed separately. I still don't have the PDF plugin working; it keeps refusing to work. All in all, this was not nearly the unpleasant experience I had while setting up my last couple laptops. Those were Dells, and I have a multitude of reasons for wishing that company would drop dead. You can’t just ‘transfer’ commercial applications, because then you would have two copies, and that would be ILLEGAL and make the software company CEOs cry. If you have installed Adobe Acrobat on one PC, for instance, and you want to transfer it to another, you have to uninstall it from the original PC first, which is rather difficult if that’s been lost or stolen or blown up. Of course, you could just go with Linux and open source software, and avoid all the hassle. Good point, except that I now have 2 copies of the content. How is that different? Waiting to see if you ever get a Windows 8 tablet and how you will handle that. Will you go for the same desktop software or look for the Metro versions or substitute Metro apps for desktop ones? There’s a Metro *and* a desktop Kindle app, for example. Which would you choose? And then plop in the name or functionality of an app (audio, photo, video) and you can see what Metro stuff is available. Some of the choices make me wonder if I can skip downloading desktop versions and go with different Metro apps to have the same functionality. Of course, we’ll probably wait til hell freezes over for some Metro versions of things: Sony Reader, Adobe Digital Editions (everyone now cringes), etc. I see the damn URL broke, but it still works. I have no idea WTF all that extraneous crap in it is anyway. I intentionally ducked the Win8 issue. I need to get work done, not fight with the laptop. At some point the siren call of a Win 8 tablet will summon you — and you will surrender. Bookmark this for that day. I haven’t been able to get the Adobe Firefox plugin to work on my latest version of Firefox either. I’m not sure what’s wrong with it. It refuses to display PDFs in the browser. I usually get a blank screen with the Adobe border around it. I wonder if that is a Win 7 issue? I have the latest Fox and plug-in and it works fine, but I’m still on XP. Are you using 64-bit 7? UPDATE: Goddammed incomptent Adobe strikes again. Firefox forced me to update the damn plug-in and now it doesn’t work at all for me, either! In fact, it locks up Fox and I have to struggle to get the damn Task Manager to kill it. I second the recommendation to look at user reviews, not just blogger reviews. Notebookreview.com has fora for all the various manufacturers, and that’s been my go-to site for years whenever I’m looking for a new laptop. One problem is that many reviews (even user reviews) are written immediately after purchase, and so there hasn’t been enough time to notice deep issues like battery life. (Although Tom’s Hardware and other HW sites have some good benchmarks for that). Conversely, many forums will be dominated by complainers whose issues may not be typical or even significant (though it does give a clue about which issues tend to come up). I bought a laptop recently as well (due to a motherboard failure). I bought a HP laptop with an i7 chip, 750 gigs and 8 gigs of RAM. My biggest lesson learned was that there exists no way to convert/adapt data from firewire to USB and that it is practically impossible to find a laptop with firewire ports anymore. (There are workarounds, but none of them seem to be reliable). I realize that you may use Calibre for more tasks than I do, but I just put my non-DRMed ebooks in a Dropbox folder (I paid for the upgrade plan) and put Calibre outside Dropbox. I also bought two backup drives for backing up entertainment files (which I sync manually — although I guess by now I need to investigate syncing solutions). @Jon Jeremy, yes you can just “transfer” commercial apps. Once installed on the new computer, serialized apps will deal with it in a few different ways, such as halting the startup of the app and asking that you deauthorize the previous install, or request you input the serial, and so on. Adobe software (including Acrobat) allows for 2 concurrent authorizations as long as they’re not run simultaneously, so it should start up without a peep. I just got a new laptop last month. I moved 450 GB of apps, personal settings, fonts, and files from my old laptop to the new one (which had a later OS) in about 25 minutes. That’s because I was using the Mac OS’s utility, Migration Assistant, and was able to use my USB 3 external hard drive (Time Machine backup) for the transfer. I am positive there are similar programs for Windows. How do you restore from a backup, for example? I don’t think they make you reinstall all your apps. From a OS X perspective: I got a new mac book air upgrading from an old mac book pro. I did a time machine sync before starting up the new mac and when I started the mac I did a time machine restore. Everything including profiles was restored. I’m rather impressed since I thought I would be fighting missing apps, etc but it was all there. I was impressed. The passwords for my email accounts needed to be set and some other settings (passwords) needed to be re-entered but all in all not a bad experience. Thanks for the backup info, I’ll be migrating my mother-in-law from XP to Windows 8 later this month and this is a good starting point. If you are writing about a “Lenovo U410”, why do you have a picture of an Apple Macbook with the title “Lenovo Macbook”? That is not a macbook. It is the lenovo U310. 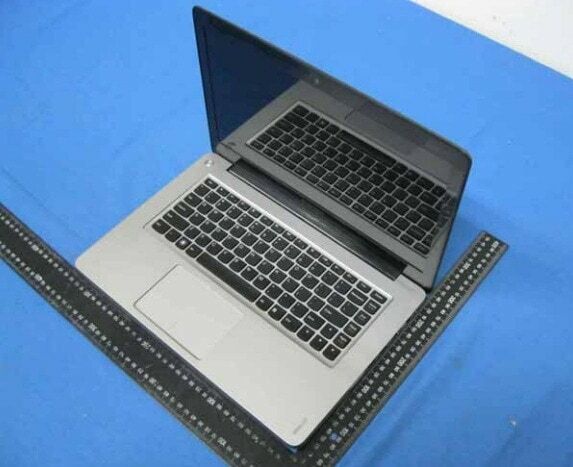 Like the U410, this laptop looks like a macbook clone. I call my laptop the Lenovo macbook as a joke. The U410 is on the left. Would you have been able to tell the difference if I had not told you? To be fair, they are all “copying” the Vaio laptops to a large extent, especially with the metal finish and Sony’s distinctive chiclet keyboard. I also think the colored body and plastic frame (as opposed to one sheet of glass) make the Lenovo line distinctive from most other laptops. I’m not sure why Firefox completely refuses to handle the transfer of application settings. Unfortunately, like most other people, I assume, the workaround is easy enough that I simply have no interest in fixing the program myself. Everyone might be copying the Vaio, but as we can tell from the commenter above the overall design of my tablet is perceived to be the Macbook design. I thought so, he thought so, and many bloggers have noted the similarity.